Let’s go Green with Laguna Lăng Cô! Cleaning Communities is a part of Banyan Tree Group’s initiative which aim to raise awareness among all associates and hotel guests to embrace the environment. The week of 1-7 June has been chosen by our group to celebrate this initiative in line with the world environment day. “Cleaning Communities Together” is a part of Banyan Tree Group’s initiative which aims to raise awareness among all associates and hotel guests to embrace the environment. The week 5th – 10th June has been chosen by our group to celebrate this initiative in conjuction with the World Environment Day. 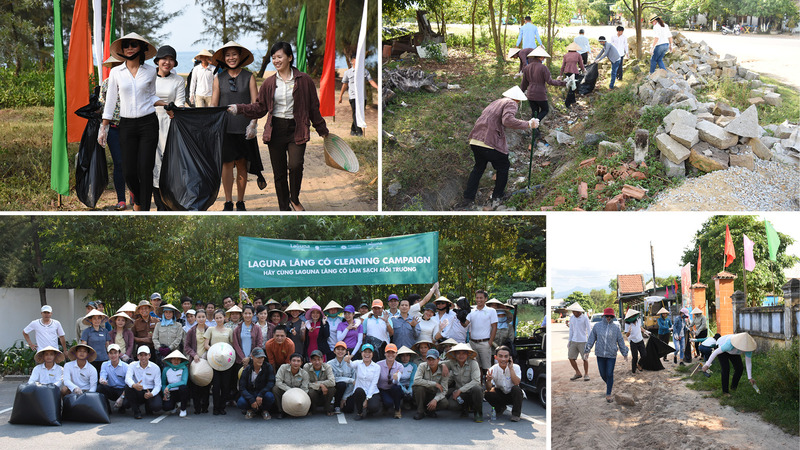 To join our hands and efforts in this occasion, in 2018, Laguna Lăng Cô conducted four days of Cleaning Community Together campaign with enthusiastic volunteer spirit from Laguna Lăng Cô HODs, associates together with local people and Loc Vinh secondary students. The day had a participation of 17 Laguna Lăng Cô associates, 65 local people from Loc Vinh commune. Totally 79 kg of garbage were collected and sent to the Loc Vinh central garbage. 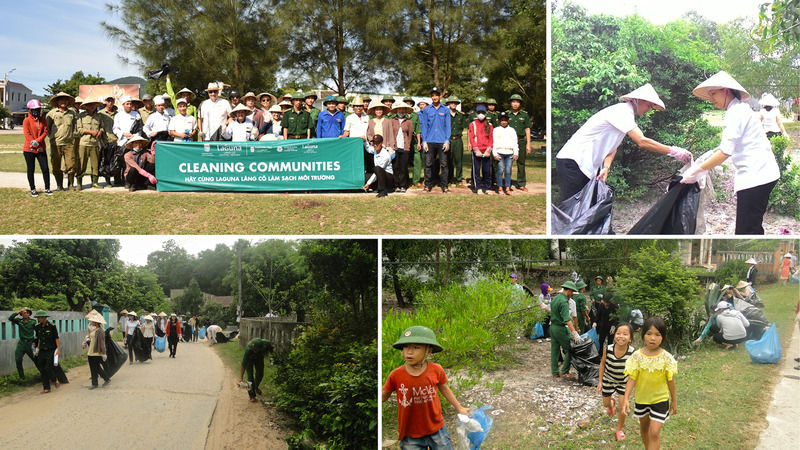 Laguna Lăng Cô organized the cleaning activity nearby Binh An and Canh Duong residental. The cleaning day was much effective with the involvement of 30 Laguna Lăng Cô associates, 117 local people and Loc Vinh secondary students. After more than an hour of hard work, we collected 360 kg of garbage, brought the cleanness for assigned areas. There were more than 80 participants including Laguna Lang Co associates from Seedlings team, Kitchen, Golf, F&B, Engineering… and over 60 local students in Loc Vinh Secondary School who has been with us in Green Heart program so far. Totally 180 kilograms of garbage were collected and sorted to 2 types of garbage: recycle garbage and non – recycle garbage with the joyful support of all participants. With 59 students in Loc Vinh Secondary School, Laguna Lang Co has collected 40 kilograms of garbage in Xom Coi in Loc Vinh Commune. In spite of the unexpected weather, Laguna Lăng Cô finished 2 days of Cleaning Community Together campaign with enthusiastic volunteer spirit from Laguna Lăng Cô HODs, associates together with local people and representative of Loc Vinh Military and Loc Vinh Communist Youth Union. Day 1: 5th Jun | Binh An Commune, particularly along the main road, Binh An residence and the local market. We had a participation of 32 Laguna Lăng Cô associates, 33 local residents and representatives from Loc Vinh Military and Loc Vinh Communist Youth Union. Day 2: 7th Jun | Canh Duong beach and nearby road along Canh Duong residence. There was involvement of 35 LLC associates, 15 local soldiers from Loc Vinh Military. 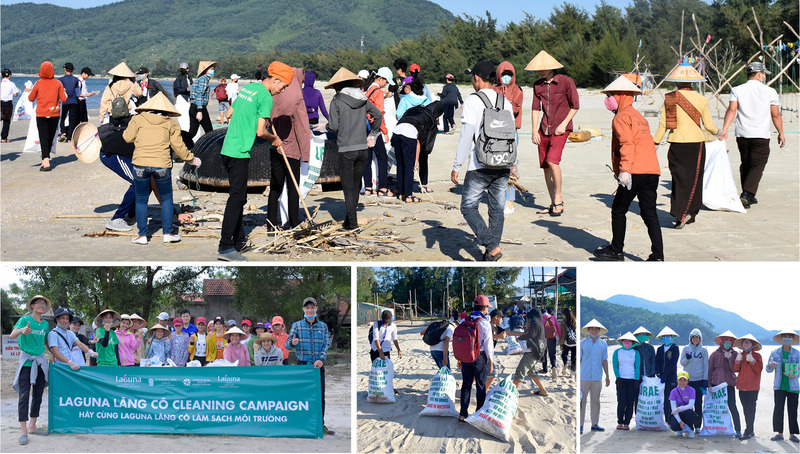 In-conjunction with group innitative and World Environement day, Laguna Lăng Cô CSR continues our commitment to give a hand to tackle this global issue by organizing 2 days of cleaning activities in 2 different locations: Canh Duong Beach and Binh An Commune. After over an hour, our volunteers collected 90 kg of rubbish and made the beach look much nicer and cleaner. The effort was highly appreciated by the local community with their support and spontaneous participation. 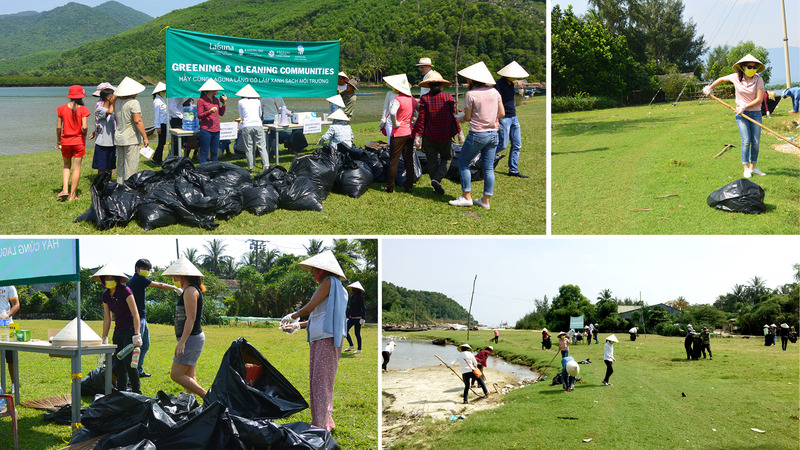 Celebrating Banyan Tree’s group-wide Cleaning Communities campaign, Laguna Lăng Cô organized 3 Cleaning Communities Days from June 1 to June 7 at 3 different locations including the nearby Canh Duong beach, Binh An commune and primary school, and Hoi An old town. Aside from these dates, the hotels also organizes monthly beach cleaning day at Angsana and Banyan Tree beach with the participation of guests and associates. More than 70 kg of rubbish were collected by 22 associates. The effort was highly appreciated by the local community with their support and spontaneous participation. More than 110 kg of rubbish were collected by 26 associates and nearly 100 students at Binh An primary school. More than 50 kg of rubbish were collected by 16 associates including Laguna Lăng Cô management and Seedlings restaurant’s staffs, with the support of nearly 30 trainees from the local REACH organization. The campaign attracted the attention of local people and tourists in the ancient town.